Even though Apple CEO Tim Cook thinks of Google Glass as siloed technology without broad appeal, his company continues to fill our heads with head-mounted tech ideas. 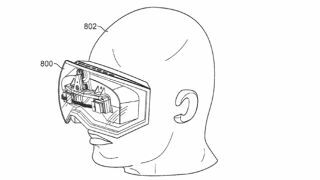 The latest comes from a patent revealed today under the simple filing name "Head-mounted display," according to the US Patent and Trademark Office and first discovered by Patently Apple. The invention is described as a 3D goggles system for viewing personal media that "may resemble ski or motorcycle goggles." In other words, you could have a guaranteed front-row seat to a movie or you could privately view some sensitive content, but look like you may be about to participate in some extreme sport in the process. The 14,000-word patent makes Apple's head-mounted display out to be more of an Oculus Rift rival than a Google Glass competitor. Illustrations depict a cover for both eyes, a frame, optical components for generating the media display, and a lens on which the generated media is shown to the user. The patent text only mentions gaming once, but its repeated uses of 3D suggest that Apple is leaving the door open to video game-capable hardware in the future. Even more unique than the potential for 3D video games is the fact that the goggles could include data processing technology that adjusts left and right images to account for a user's eyesight limitations. Not even Google has been able to account for glasses wearers, although Google Glass with prescription lenses are said to be coming in 2014. Also on the patent docket: Apple patent hints at future devices with curved displays.